Varroa mites have been in the United States since 1987, but there’s still not a good solution for controlling them. These mites impact honeybee colonies by feeding on the bees and vectoring viruses. The mites pass viruses around the colonies and make the bees very sick. 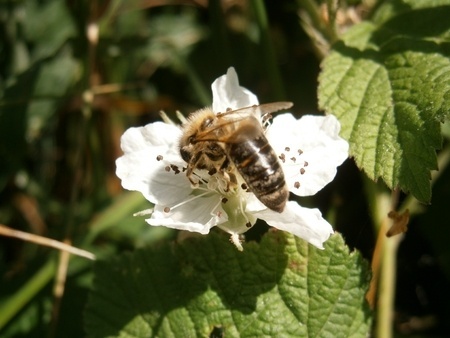 Varroa control is tricky because the goal is to kill an arthropod that’s on another arthropod. Cameron Jack is an apiculture lecturer and distance education coordinator in the entomology and nematology department at the University of Florida. His PhD work has been on Varroa control. Jack’s research involves taking an integrated pest management approach to find different options to figure out what is the most effective. Jack and other researchers work with beekeepers all over the world while trying to find solutions to the mite problem. The lab work happens at the UF Bee Lab, but the field work is happening everywhere. Varroa mites affect not only beekeepers trying to make a living, but also growers who need pollination for their crops. “The problem is that commercial beekeepers are constantly having to split their colonies to maintain their numbers,” explains Jack. “This makes them have a very hard time filling their pollination contracts. If beekeepers can’t control Varroa, then they’re going to have a very difficult time keeping healthy bees and big strong hives, which is what’s required to fulfill their contracts for pollination.” The contract requirements are typically about a basketball-size amount of bees or 10 frames of bees, depending on the contract and the grower.